Same faction Alderaan Civil war. Ranked warzones are on for patch 1.3 but could be disabled if the quality is not there. Free server transfers is just the beginning, mega server clusters is a concept in development. Free server transfers – make it easier to play with your friends. 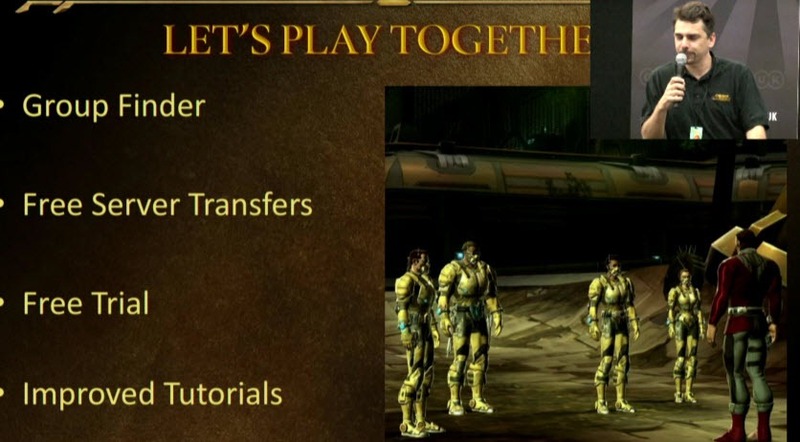 A lot of players created a lot of characters on different servers and when we introduced the Legacy system, they were kinda bummed – with the transfer you can regroup all your characters and put them under the legacy and really reap the benefits of all your hardwork. When the merge happens, we are using a very generous system so none of the hardworks you have done is lost. Free Trial – Maybe you have friends that have not tried the game yet – maybe they are reluctant to spend money on a game they don’t know if they are going to like. We had free trials in the past and they were a bit complicated – only on certain weekends, you had to give a token to your friends etc. Now we have simplified it and starting in 1.3 you will be able to play the game for free to a certain level permanently. Improved Tutorials – We have done a ton of improvements to the tutorials to ensure that even if you are completely new to the MMORPG genre, you will have a good experience. Keep original group after warzone – simple fix to make grouping with other people a much enjoyable experience. 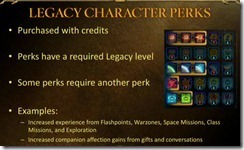 Per-character legacy perks – some players have just joined the game and it is all fresh and new to them. Some other players have played for 6 months and they have a very good understanding of what the game has to offer. 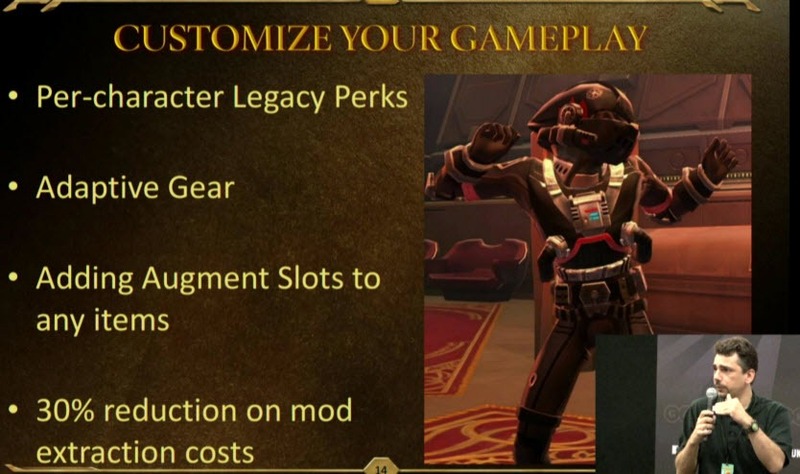 We want to recognize that and whenever these experienced players create a new character to add to their legacy, we really want them to customize what they want to do with that character. 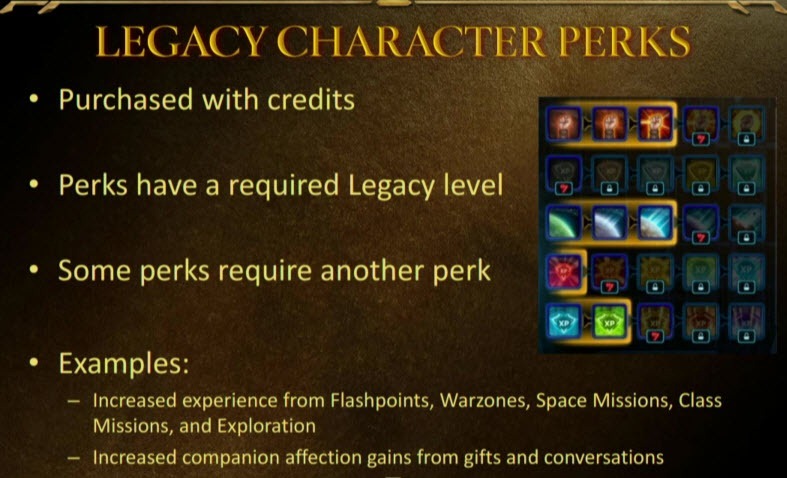 If you really like PvP, you can take legacy perks to get more xp from PvP for example. 30% reduction on mod extraction costs – small tweak that makes the life of those players that care about customization a lot easier. 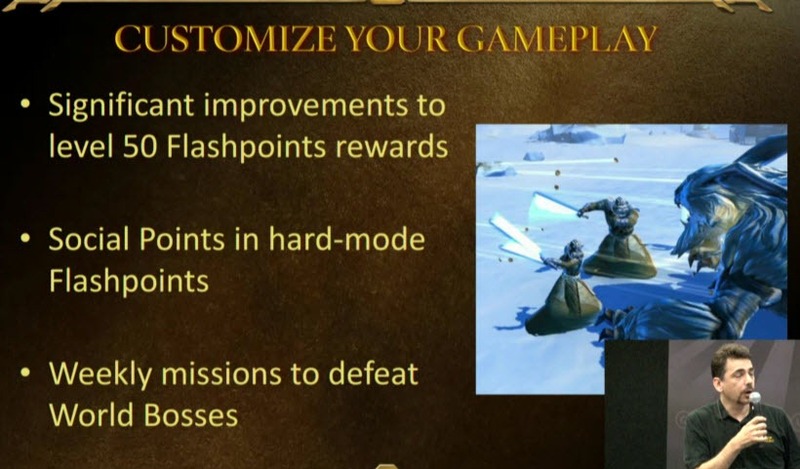 Significant improvements to Level 50 Flashpoint Rewards: Level 50 normal flashpoint rewards were not worth it. There is content available, players like to do it, but they don’t do it because they think it is not time efficient. Weekly missions to defeat world bosses. 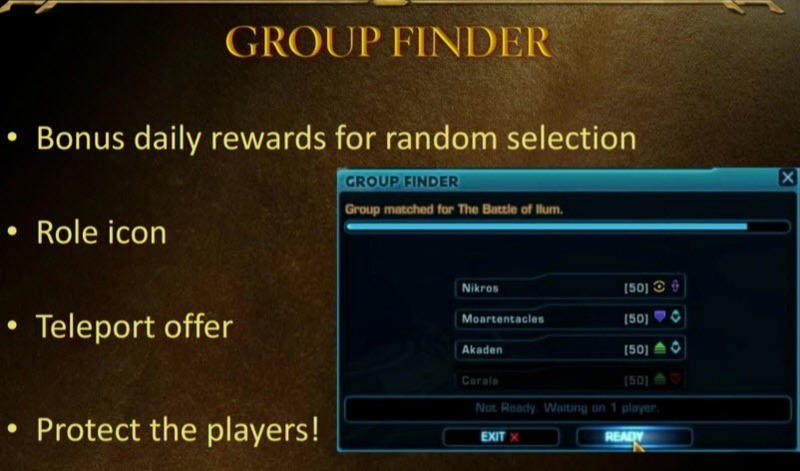 You can tell the group finder specifically what you want to do and what you don’t want to do. Of course, the more picky you are, the more difficult it is going to find players that want to do the exact same thing. We will reward you for being less picky – i.e. yes I want to do any flashpoints at my level. You can specify the role you want to play – this is particularly important in the levels 10-30 where you havn’t really specialized a lot – your character is well able to do all kinds of different roles. Offers teleport to players for instanced content (i.e. flashpoints) – you can get into the action straight away, no need to wait for players to travel back from where-ever they were etc. Protect the players – in a normal group group leaders have a lot of power – they can define the loot rules, kick people etc. Kicking players requires vote-kicking. We know you have being playing for quite a while because your legacy levels is quite high. These perks are not meant for those who just joined the game – they probably don’t even know the difference between the different contents. 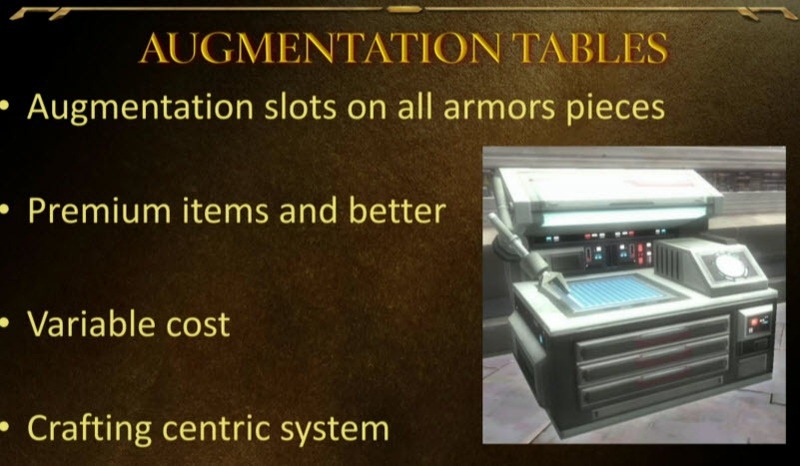 Augmentation system currently great if you want to craft gear for yourself but it is not so great for those looking to commission gear from crafters as there is a high chance for the item to not crit and gain an augment slot. Make both crafters and non-crafters life easier – crafters can make kits, put them on market, non crafters can just buy a kit from crafters and add a slot on their own time. 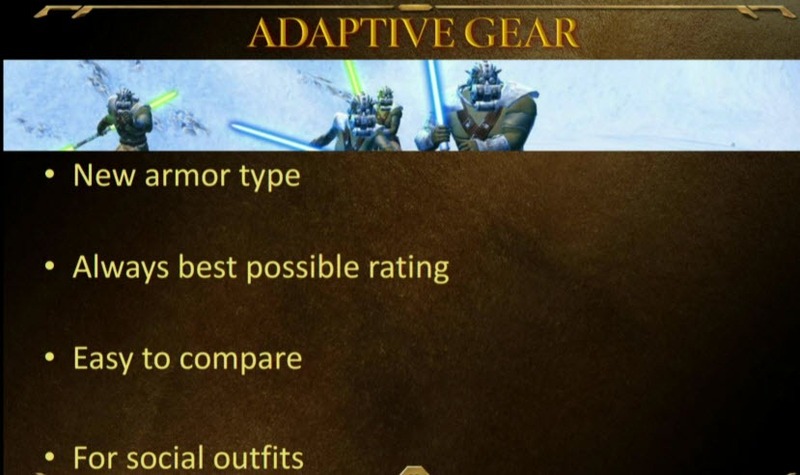 New Armor type – always best possible rating. Q: It is coming out this summer? Can you be more specific than just this summer? Q: Its there going to be a MAC version of the game? A: I am going to be honest, we are not working on one. We know that it works quite well in Bootcamp but it has not being required until now. We always listen to our customers and would-be customers and it has not come up as a priority. We are expanding the market, we are going into new territories and it would make some sense to do it for a new platform but I am not aware of the development at this time (for Mac). Q: Coming from a previous big MMO, I quite like numbers and I find it quite hard in SWTOR, for example, without having any addon support. Damage meters are invisible so I actually don’t know how well I am doing and it is very hard to diagnose for example, if you are dying in a group situation to find out where the problem is. Are you plannin to let on addons into the field or implenting damage/healing meters. A: We released in 1.2 a way for players to build damage meters, it is not instantaneous – it is not something you can see while you play but basically we have introduced a kind of format where all the combat logs is outputted to the hard drive. Within days, the community has created really good tools to analyze not only your own damage but share the files with your guild mates. There are now fan made apps that overlay damage meter on top of your game so you guys are doing the work for us! Seriously the players are going to be able to define what they want much better than what we could. As for addons, it has always being our plan to do that and that is something we being plugged at it. It is fairly complicated, there is a lot of security and fairness issues. (i.e. if someone made an addon that is so good it gave you an advantage then everyone has to play with it). 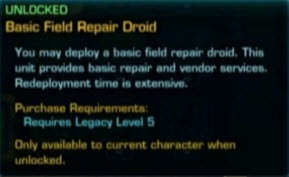 Q: When are we going to see HK-51 droid? A: Yes, we are not talking about that. I know there has being a few leaks on websites kind of hinting at it so I am going to hint at it as well and that will be all. Q: New races in the game? What races we can expect to see and what traits will they bring over? A: We call them species, it is something that has being requested by your players since beta. It is something we have been thinking about it. I am not going to tell you when unfortunately because the marketing person here will get very upset with me. Let me first explain why we don’t have them in the game already. People tell us look there are Voss NPCs, I see them in the game, why can’t I play one? Well that is because we have like 3 heads for them and 2 different skins. If we give that to you, you would say awesome I can play a Voss, but wait a second there are only two different skins – I want 20 like the other races have. So it is not just a question of grabbing an existing a model and giving it to the player. It is quite a lot of work but it is prioritized as we know it is something that players are very excited about so it is definitely something we are working on it. I can’t tell you what race we are going to release unfortunately. Q: You are adding a lot of new content to the game and stuff like that. Will there will be a point where you feel the game itself is actually finished and stop adding contents to it? A: No, that would be a terrible thing. It’s a service, it needs to never be finished or otherwise you will be like why I am paying for this service when you guys are not doing anything anymore? So its part of the deal – you pay your sub every month and we give you new stuff. Q: Any plans for customization of your companions? A: Funny story, we planned to have customizations with your companions from the very beginning but the we changed our mind. Players then asked – why don’t you have customization? Yes, you are right. We are going to continue to introduce new skins for companions but it is not a great system – it is a ok system we introduced into the game very quickly (actually I implemented it so I can brag about it a little bit). We are working on a much better system but it is not the highest priority atm although it is very important. There is a cognitive dissonance when you have two sith warriors meet up with identical Vette. Q: What is happening with ranked warzones? They were suppose to be in 1.3, but they are not? A: Oh no, it’s a warzone question! Ranked warzones, we added them in 1.2 to the PTS. You can have a very good design on paper and it is a very good design when you prototype it, and when you put it with the rest of the game you realize that it is not that good. The problem with ranked warzones we found just before we released 1.2 was that we let people just queue by themselves for ranked warzones. When you have ranked warzones, the important thing is your rank goes up and down based on your wins/loss. Something that is very personal, your rank, was in the hands of complete strangers that you have no control over. You could be starting a warzone and then you notice that guy on your team who is just terrible and just abort the warzone when the team loses. It is one thing to be upset at end of the match with your teammates whom you communicate in vent etc but it is a different thing to be upset at strangers. Rather than releasing it, we decided to disable it. We went back to the drawing board to create a good experience where you queue up for the ranked warzones as a complete team (not a group of 4 but a group of 8). We also had to make sure that once the warzone is over, your group is not dissolved. When we made this decision, we realized that we have to fix a lot of things to give you a good experience. It is going to be on for 1.3 but whether it is enabled or disabled it is going to dependent on all the testing we done internally and on the PTS. It is going to be very disappointing personally and for you guys if it is not on but then again we reserve the right to postpone it if it is not to the quality we want. Q: Free server transfers, are they are going to be limited and if not how are you going to stop people from exploiting it? A: We are testing the transfers. Of course we kind of tested it when we opened up the Asia Pacific servers but we are trying to make a much better interface. We have not decided on the details of whether allowing you to go wherever you want, which is what I would prefer. Now the exploitable part, the fear that someone who is very rich on one server will take all his money to another server to dominate the market. We are taking some steps but it would be to punish players who have being exploiting (server transfers is a good time to really catch them). We are not planning to penalize people who have being playing the right way. If you cornered the market and made a little fortune for yourself then good for you, we are not planning to limit you in one way or the other. Q: Will it ever be possible to have more than one link between family members in the legacy system? (i.e. this is this person’s child, not these two people’s child). A: I designed that part of the legacy feature. There are other things I like to add before so that is not a priority. One of the features I really like to add is the new relationship- Master and Apprentice. Defining who is the child of who can get really complicated so I don’t think we are going to do that. Q:Adding rewards for people who stay neutral on the side of the force? A: I hope so. It was an original design in the game – it would have being cool to have that guy – grey Jedi but then we realized it was a lot more complicated. So it is definitely coming, in fact I announced it during the guild summit and people were wondering where it was. 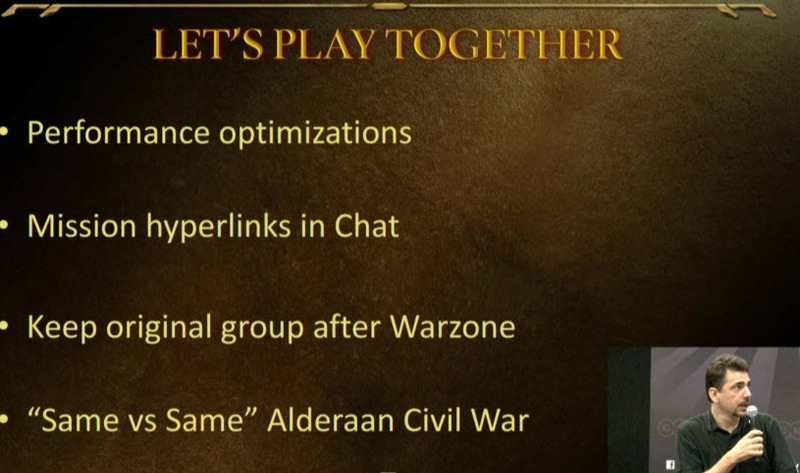 It is going to be progressive, there is a lot of rewards for being light/dark side and we are going to add rewards for being neutral. It is going to be in either this update or the next one. Q: We play on a very low population server and most of our guildmates have quit. I understand that group finder in 1.3 will help but are there any plans to merge servers or move them into clusters. A: Server transfer is a first step – it allow you to go a server you think you will be happy for whatever reason. MMOs are social phenomena like Facebook, the more people you have to play with, the better the experience. I know Daniel Erickson has mentioned the concept of mega-servers. It is a great concept because if you have a server population that can accommodate a lot more players, you will be much more likely with your friends and everything is suddenly better – warzones pop all the time, group finders pop all the time. Server transfers is just the beginning. Great summary Dulfy, a lot more detail than one I head read earlier. However, I’m very bummed there is no mention of Nightmare EC with 1.3 or in the upcoming PTS testing. Same, I asked that in the thread for June 1’s Q&A so hopefully they might pick it up and answer it. They are NOT releasing NM EC with 1.3, they already said that. I do think it will come in a 1.3.x as they want 1.4 to be their next Ops thing with the next tiered gear n so on. Should also be a good time to go from Pre-Season to Season 1 in ranked PVP aswell for new gear tiers n so on. I actually have not heard any official word on the fate of Nightmare EC, care to link where you saw the devs mentioned this? From the way he fumbled that answer, I bet no ranked warzones in 1.3. I think they are playing safe for ranked WZ. That is why the fumbled answer. I hope they manage it, as yes the game lost many PvPers. 80% if not more of those that left are indeed PvPers. First you remove Ilum and then no ranked WZ. Nightmare EC. AFAIK less to 10% of all Guilds managed this globally. But they will make it, I guess as is not so much a big deal. the current trial for 7 days is limited to starting planets, first FP, fleets and homeworld, With a level cap of 15. I wouldn’t expect that to change. Some classes are not very good until they reach 22-23+, because of the low amount of skills you can use below level 20. In my opinion the trial should reach level 25 to offer more experiences about the playstyle with that class. With my gunslinger i liked a lot the storyline but i felt my char was really underpowered before reaching level 30, for example. Some classes get medic companions soon, some other have to wait till around level 40 to get a medic. This is specially annoying on pure dps classes. Hello Dulfy! My first comment on your site, however I’ve been following you for a while now and your site is very informative and precise, so congratulations for that. I have a few questions regarding adding augment slots in 1.3 if you’d happen to know the answer on these, I’d be very happy. 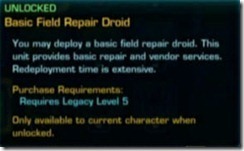 First, is it true that we will be able to add augment slots to offhand items, implants, earpieces, as well? If yes, will any crafter (synth, armor, arms,) be able to do it with their regular augment construction kits? Hope that helps and woot first comment!